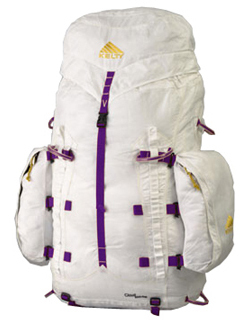 For many years, I have know of the Kelty packs made of Spectra. I finally bought one. 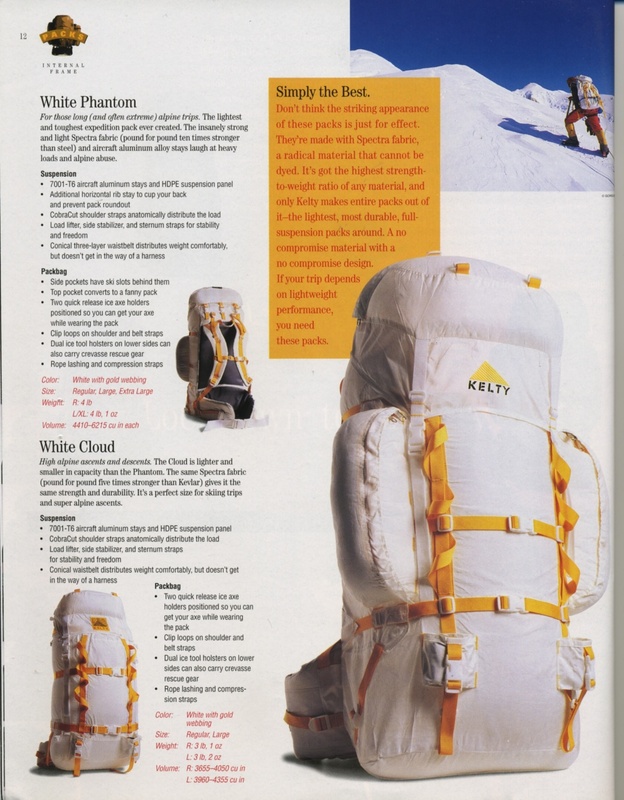 This page is a collection of everything I can find about the Kelty spectra packs. There are some files I have downloaded from Kelty. There are some old web pages, saved by archive.org, and presented here. Some old web pages are missing pictures. This is not an oversight on my part, the pictures simply weren't saved by archive.org. There are some pages from old catalogs that I have kept over the years. If anyone has some info that isn't here, I would appreciate a copy if it to add to the modest data presented here. 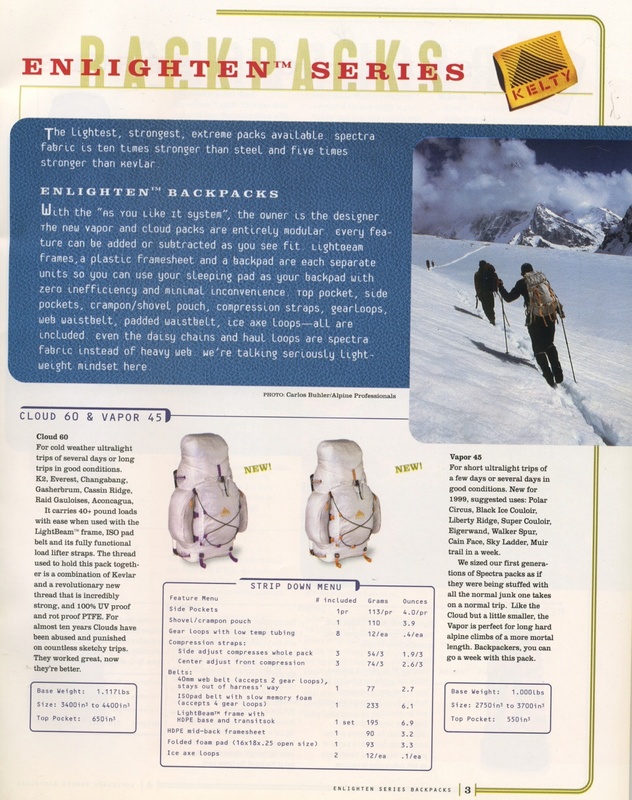 I would really appreciate old catalogs describing the Kelty Spectra packs. 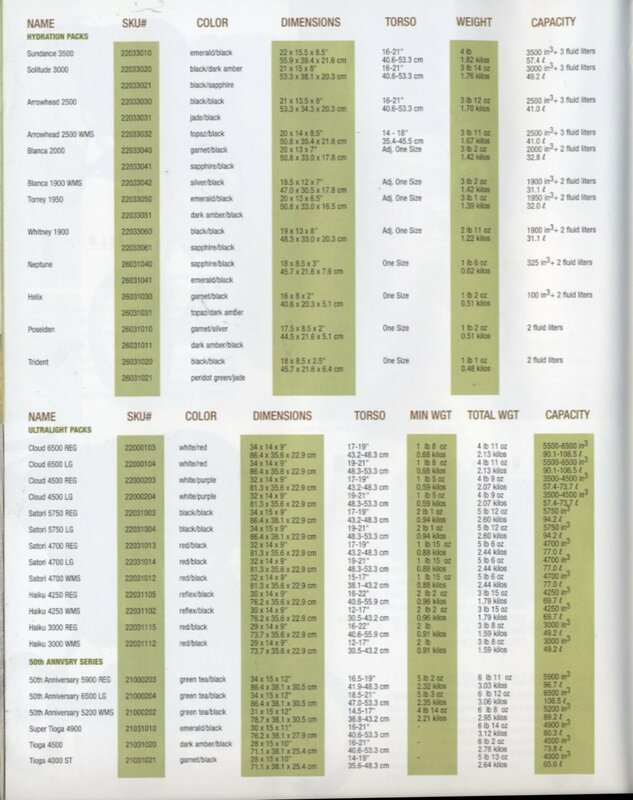 I put the catalog scans at the bottom of the page, as they are a bit on the large side for some. For those long (and often extreme) alpine trips. 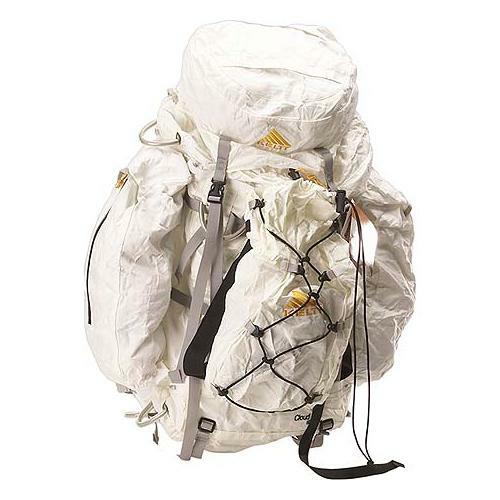 The lightest and toughest expedition pack ever created. 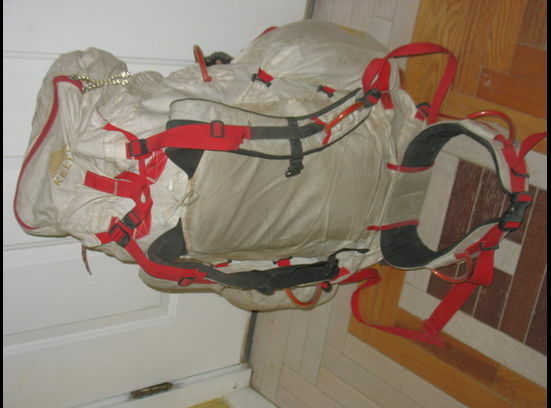 The insanely strong and light Spectra fabric (pound for pound ten times stronger than steel) and aircraft aluminum alloy stays laugh at heavy loads and alpine abuse. High alpine ascents and descents. The Cloud is lighter and smaller in capacity than the Phantom. The same Spectra fabric (pound for pound five times stronger than Kevlar) gives it the same strength and durability. It's a perfect size for skiing trips and super alpine ascents. 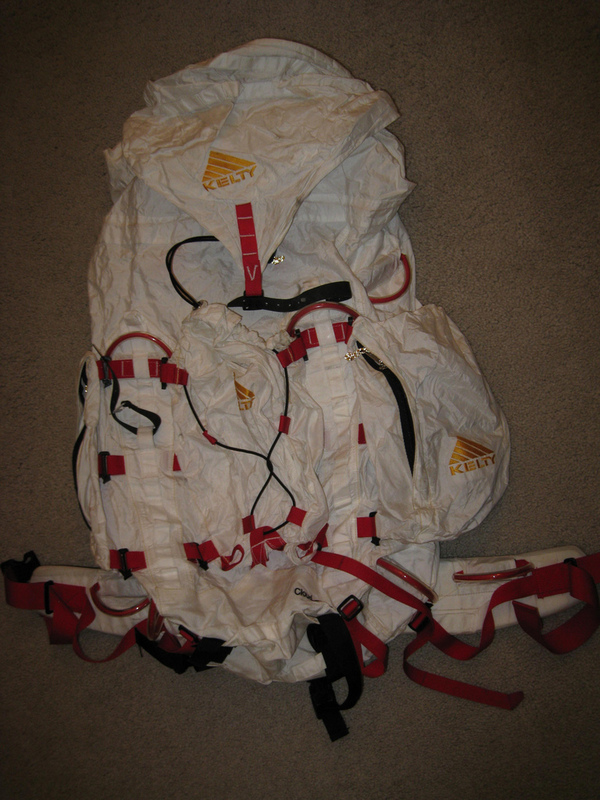 The original spectra pack. 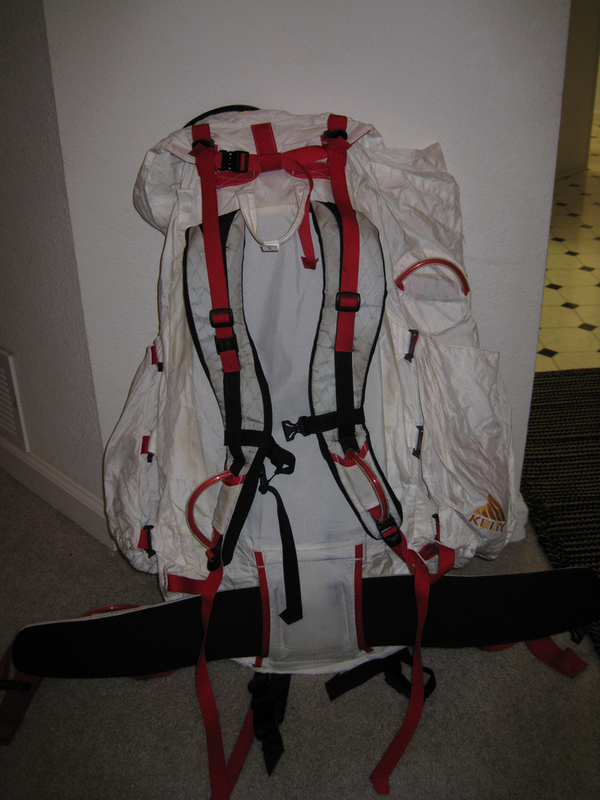 The Vapor will easily haul gear for short, ultralight climbing trips of 3-4 day summer backpacking trips. Special features • Lightest, strongest packs available. • Spectra fabric is 10 times stronger than steel. • Customized component system. 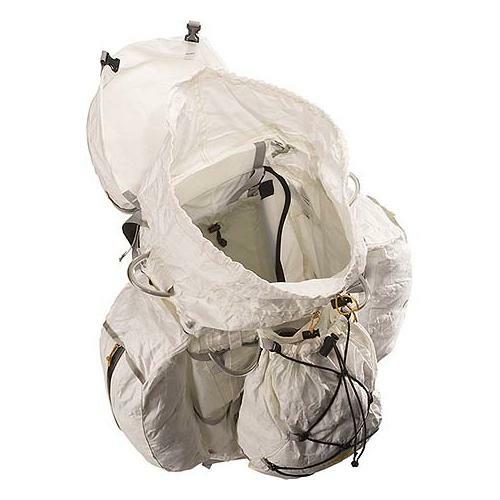 Designed for cold weather, ultralight trips, the Cloud easily carries 40+ pound loads comfortably when used with the LightBeam frame, ISO pad belt, and Load Lifter straps. 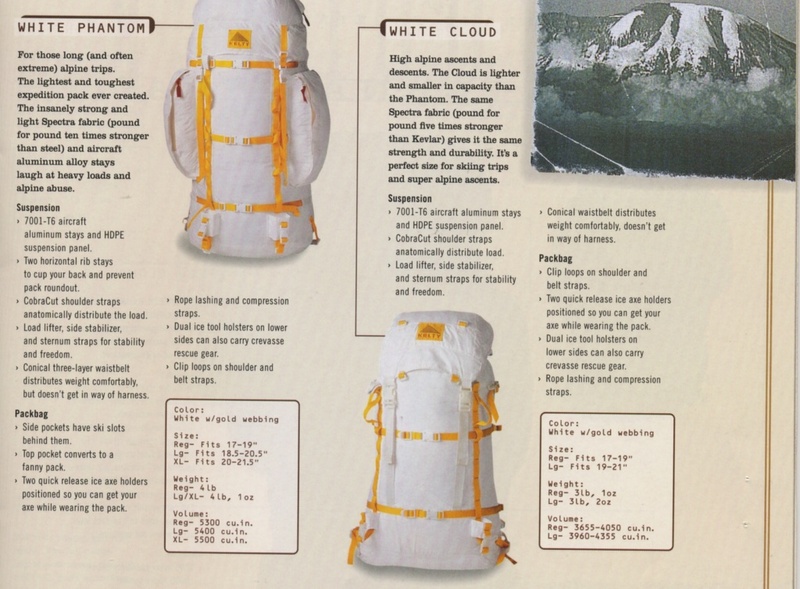 The ultimate Denali pack. For extended winter mountaineering adventures. 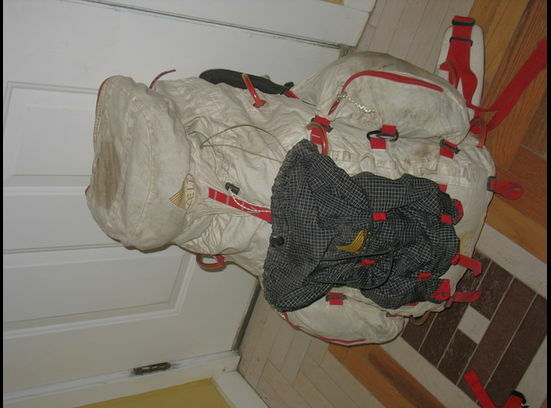 Alpinists can now haul their heavy winter gear without adding weight to their load. 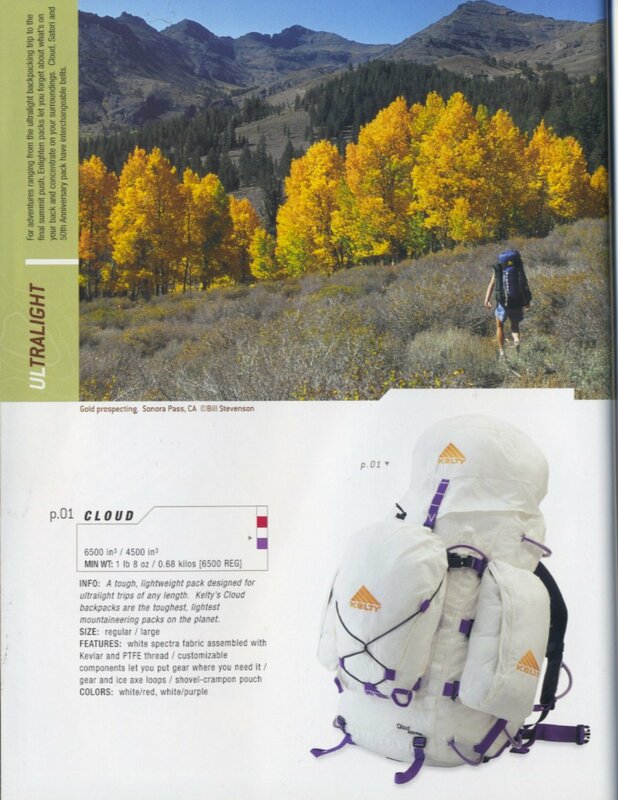 Special features • Lightest, strongets packs available. 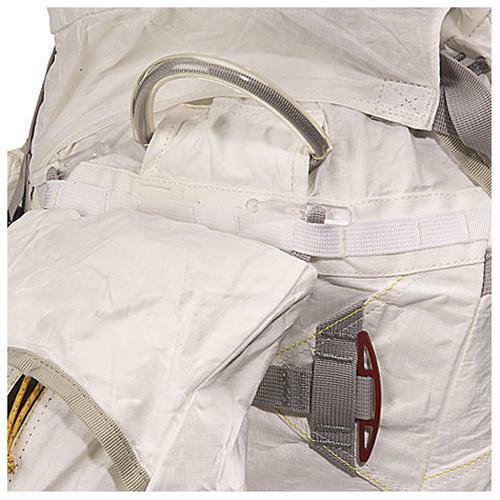 • Spectra fabric is 10 times stronger than steel. • Customized component system. 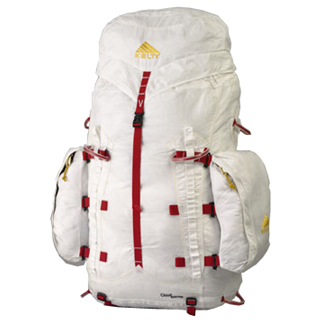 The Enlighten packs are the lightest, toughest, mountaineering packs on the planet. The Cloud 4500 is for stripped-down, cold weather trips. 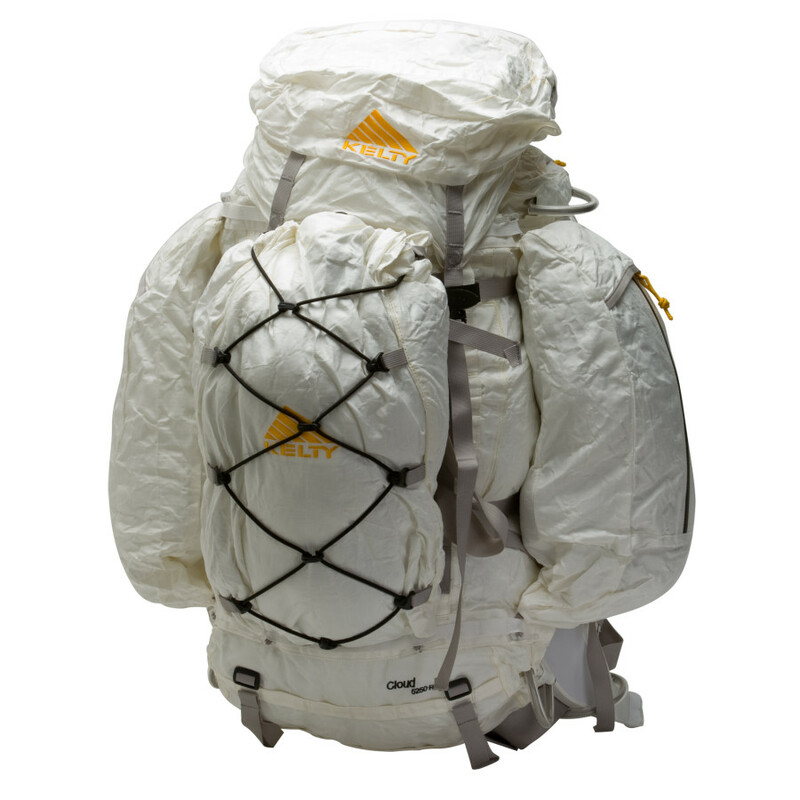 The Enlighten packs are the lightest, toughest, mountaineering packs on the planet. The Cloud 6500 is for extended winter mountaineering. 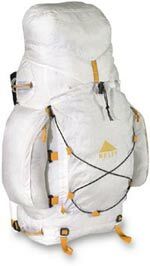 The Enlighten packs are the lightest, toughest, mountaineering packs on the planet. 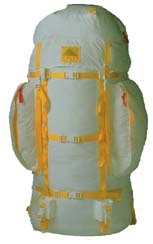 The Cloud 4000 is for short, ultralight climbing trips. 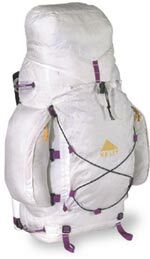 Torso Fit Range: Reg: 17-19"
The infamous "white pack". The lightweight, durable choice of mountaineers and gram counters. Dimensions: 14" x 9" x 32" 14" x 9" x 32"
Torso Fit Range: 19" - 21" 17" - 19"
Dimensions: 14" x 9" x 34" 14" x 9" x 34"
Cloud 4000 - ON SALE! 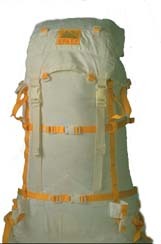 A tough, lightweight pack designed for ultralight trips of any length. 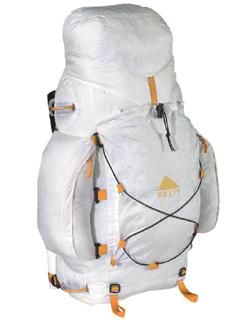 Kelty's Cloud backpacks are the toughest, lightest mountaineering packs on the planet. Dimensions: 14" x 9" x 30" 14" x 9" x 30"
Cloud 4500 - ON SALE! 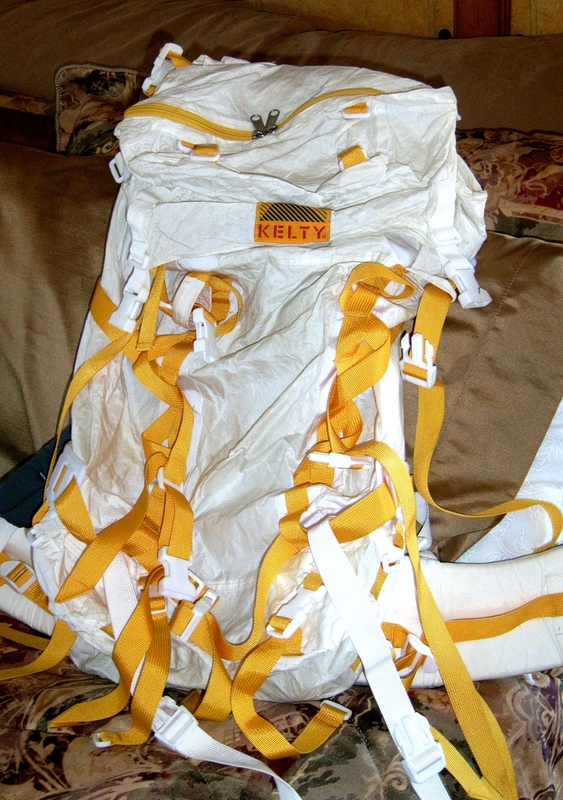 The famous "white pack". The lightweight, durable choice of mountaineers and gram counters. 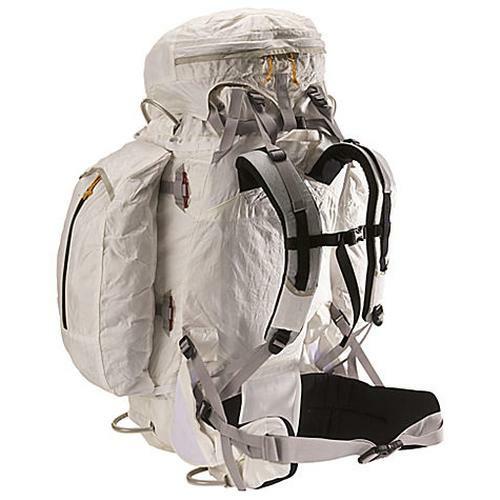 Super-strong ultralight pack with removable pockets and climbing accessories. Dimensions 34" x 17" x 9" 34" x 17" x 9"
Torso Fit Range 19.00" - 21.00" 17.00" - 19.00"